Configuration: 24 packs per box. Featuring the Most Sought-After NFL Rookies and Veterans on Alluring Chrome Technology. PRODUCT HIGHLIGHTS - Featuring On-Card Rookie Autographs! - 1 Rookie Autographed Card per Hobby Box! PRODUCT DESCRIPTION AUTOGRAPHED CARDS Rookie Autographs The NFLs top rookies on chrome technology, including on-card autographs. Hot Box Refractor Seq #d Falls 1 per case. Black Refractor: #d to 25. Pulsar Refractor #d to 15 - Gold Refractor #d to 10. Red Refractor #d to 5. HOBBY ONLY - SuperFractor #d 1/1. HOBBY ONLY Rookie Autograph Patches The NFLPA Rookie Premiere subjects featured with an on-card autograph and multi-colored patch on chrome refractor technology. Cards will be seq #d. Dual Rookie Autographs The most collectible rookie pairings in the NFL on chrome refractor technology. 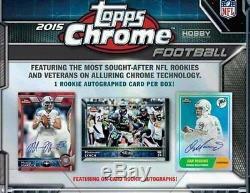 Triple Rookie Autographs The most collectible rookie trios in the NFL on chrome refractor technology. Rookie Autograph Variations On-card autograph versions of the Rookie Variations on chrome refractor technology. Veteran Autograph Variations Autograph versions of the Veteran Card Variations on chrome refractor technology. Topps 60th Anniversary Autographs The most iconic Topps football designs published over the last 60 years showcasing the most impactful NFL veterans and rookies from the 2015 season. These high-profile autographs will be featured on chrome refractor technology. 1989 Topps Football Autographs The top rookie autographs featured on the classic 1989 Topps Super Rookie design in chrome technology. Autographs will be on card. 1976 Topps Football Autographs The top rookie autographs featured on the vintage 1976 Topps design in chrome technology. SuperFractor - #d 1/1 HOBBY ONLY NEW! All-Time 1,000 Yard Club Autographs Showcasing the greatest WRs and RBs of all-time featuring autographs on chrome technology. All-Time 4,000 Yard Club Autographs Showcasing the greatest QBs of all-time featuring autographs on chrome technology. INSERT CARDS Topps 60th Anniversary The most iconic Topps football designs published over the last 60 years showcasing the most impactful NFL veterans and rookies from the 2015 season. Pulsar Refractor - #d - SuperFractor - #d 1/1 HOBBY ONLY 1989 Topps Football The top rookies featured on the classic 1989 Topps Super Rookie design in chrome technology. Gold Bordered Refractor - #d to 75. Pulsar Refractor - #d to 50. SuperFractor - #d 1/1 HOBBY ONLY 1976 Topps Football The top rookies featured on the vintage 1976 Topps design in chrome technology. SuperFractor - #d 1/1 HOBBY ONLY Super Bowl 50 Die Cut This die-cut insert honors the retired legends and veterans that have won a Super Bowl. Refractor - #d to 99. SuperFractor - #d to 1 HOBBY ONLY ALL-TIME 1,000 Yard Club Showcasing up to 30 of the greatest WRs and RBs of all-time on chrome technology. ALL-TIME 4,000 Yard Club Showcasing up to 15 of the greatest QBs of all-time on chrome technology. BASE CARDS BASE CARDS - Veterans 100 players featuring the best 2015 NFL veterans. Rookie Cards 100 players representing the most impactful 2015 NFL rookies. BASE PARALLEL CARDS - Refractor Parallel: 8 per hobby box. Blue Wave Refractor: 1 per hobby box. Green Refractor: 1:12 hobby packs. STS-Bordered Refractor Parallel: #d - BCA-Bordered Refractor Parallel: #d - Pulsar Refractor Parallel: 1 per box. HOBBY ONLY - Black-Bordered Refractor Parallel: #d - Blue-Bordered Refractor Parallel: #d - Sepia-tone Refractor Parallel: #d. HOBBY ONLY - Gold-Bordered Refractor Parallel: #d. HOBBY ONLY - Printing Plates Original Cyan, Yellow, Magenta and Black Printing Plates. HOBBY ONLY LOOK FOR 2015 Topps Chrome Diamond Parallels Hot Boxes! - Diamond Parallel: Diamond Boxes Only; 1 per pack. Rookie Card Variations Up to 25 Rookie cards featuring a variation image. Veteran Card Variations Up to 30 Veteran stars featuring a variation image. The item "2015 Topps Chrome Football Factory Sealed Hobby Box PRESELL" is in sale since Wednesday, September 23, 2015. This item is in the category "Sports Mem, Cards & Fan Shop\Cards\Football". The seller is "tntnorthnj" and is located in Tallman, NY. This item can be shipped to North, South, or Latin America, to all countries in Europe, to all countries in continental Asia, to Australia.